It is 40 years into the future and the world is in turmoil. A plague has destroyed humans' ability to conceive females, or so Callum thinks until he meets Bo. A page-turning adventure unfolds as the pair rely on each other to survive a dangerous journey to a safe haven in the city of Vulture's Gate. One girl - could she be the last girl alive? One boy, pursued by reckless men who have kidnapped him from his fathers. Bo and Callum go in search of a safe haven, a place to call home. But where can they turn and who can they trust? 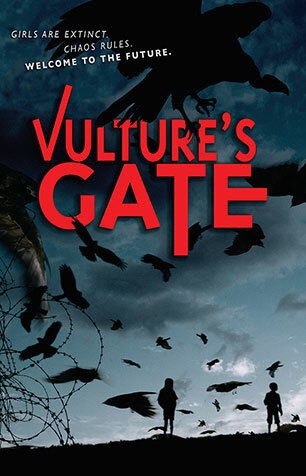 When every stranger is a threat, does their only hope lie in reaching Vulture's Gate? Following a journey that takes them across barren deserts and lost valleys, Bo and Callum must discover how to survive alongside runaway boys and crazed religious terrorists, in a world with an uncertain future. And what is the disturbing secret at the ruined city's core? Kirsty Murray is an award winning author of nine novels for young people including Vulture's Gate, Zarconi's Magic Flying Fish, Market Blues, Walking Home with Marie-Claire and the epic quartet of historical fiction 'Children of the Wind'.